Mbira music legend Stella Chiweshe will share the stage with Mbira Dzenharira and emerging Afro-fusion group “Were” at Pakare Paye Arts Centre in Norton tomorrow night. Fondly and respectfully addressed as Ambuya, Stella Chiweshe has been a celebrated music icon for several decades in which she has won acclaim at home and beyond Zimbabwe’s borders from her base in Germany. Though she has operated in Europe for the greater part of her music career, Chiweshe has not lost contact with her homeland. 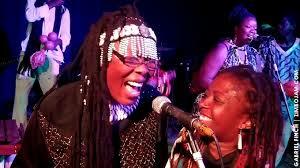 In the last three years she has performed several times at the Book Café during her annual visits to Zimbabwe. The mbira queen was one of the last musicians to perform with the late mbira star Chiwoniso Maraire before her untimely death in 2013. With the veteran mbira musician sharing the stage with Mbira Dzenharira during the forthcoming concert supported by Pamberi Trust, the Pakare Paye event promises fireworks. The Tendayi Gahamadze-led Mbira Dzenharira survived the acrimonious departure of several key members five years ago who went on to form their own band which they named Maungira Enharira. After the split, Mbira Dzenharira went on to produce three highly-competitive albums, Fare Fare Tindike, Todya Fora and Nyamubvambire Wamuka. The Norton concert will also provide a platform for the upcoming “Were” who have captured the imagination of music fans in the Zimbabwean capital city over the past two years. The Music Crossroads winners, who toured Norway last year, capped a fine debut year into music by being selected to perform alongside several seasoned groups during the 2013 October World Music Festival held in Harare.